This cue ball has a fair few chalk marks and needs a good clean. Cleaning chalk marks, stains, and yellowing off of billiard balls is actually a fairly easy process. Detergent and water: useful for semi-regular cleans (removing chalk marks). Professional clean/polish solutions: a better option if your balls need a deep clean (for removing long-term stains and getting that luster back). 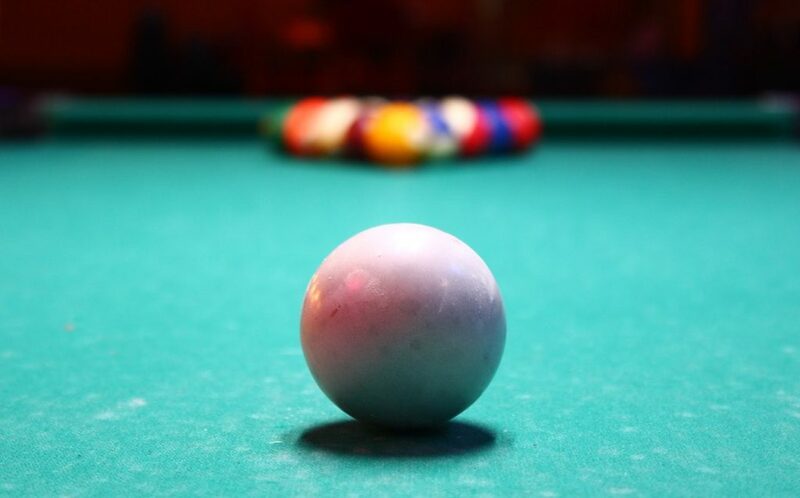 If your billiard balls are just a little dirty, all you really need to do is use soapy water. Note: this tutorial is for plastic/phenolic resin balls, not balls made of natural substances like wood or ivory. Fill one bucket with hot water at about 110° and add your detergent. Let the balls soak underwater for around 5 minutes. If your bucket is big enough, you can add all of your balls. Fill the other bucket with cold or room-temperature water. After the 5 minutes is up, grab your microfiber cloth and scrub each individual ball for 30 seconds to a minute. You might need to add more detergent to the cloth when polishing. Rinse the soap off each ball using the clean water bucket. Dry each ball thoroughly with your towel. Try not to leave them wet as this can harm the glossy finish. If detergent doesn’t quite do the job, you can use other substances designed for cleaning plastic, like Brillianize. Alternatively, you can try and use a specialist ball cleaning solution, as outlined below. If you’ve got really yellow balls, regular cleaning agents might not do the job. You’ll need to use Aramith’s specialized billiard ball cleaner. This stuff is designed for phenolic resin balls and it’s quite strong, so be careful using it on cheaper billiard ball sets. Take your first ball and apply a spot of Aramith Billiard Ball Restorer, shaking the bottle before use. Polish the ball with this substance using a microfiber cloth for around 30 seconds to a minute. Using another dry microfiber cloth, wipe the ball clean, leaving no restorer behind. Next, follow the same process but with Aramith Billiard Ball Cleaner. Shake the bottle, apply some cleaner, polish the ball, and wipe it down with a clean cloth. Repeat these steps for each ball that needs cleaning. Always use the restorer first, because it’s the strongest substance. It helps to break down tough stains (including yellowing, which happens as a result of oxidation) which the cleaner can then remove, returning your ball to its original luster. Hopefully you were able to remove those pesky stains from your pool balls. If you’ve got any tips or tricks to help clean billiard balls, let us know in the comments – we’d love to hear them! Cautionary tale…..I left my balls soaking for a tad too long and it wrecked the colors. Oh no! How long were they in for roughly? We might add a warning to the tutorial.